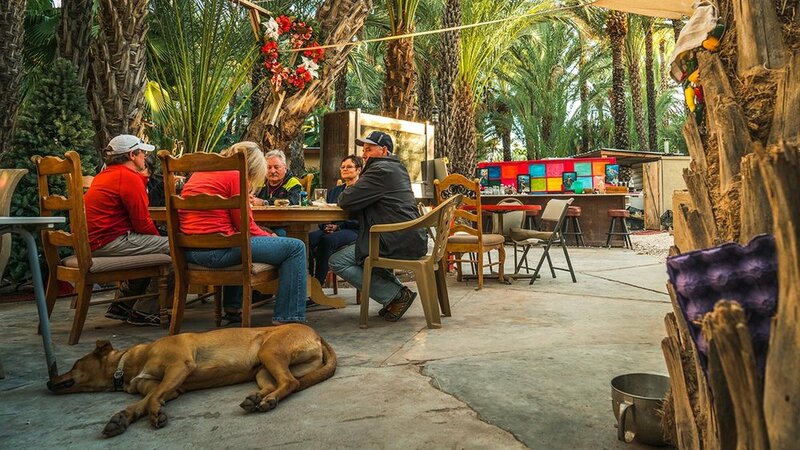 San Ignacio is the hub of Baja Whale watching, is close to aboriginal cave paintings and some of the most magnificent dessert terrain and scenery for hikers. You can trust that when in full operation, their tours will be preeminent and of the highest calibre. Every guest can enjoy sumptuous, freshly-made daily breakfast served family style. Guests sit around the huge dining table with the warm air blowing through the open plan palapas discussing where they are heading to, or what excursion they are preparing for. If you book well in advance you can enjoy one of Bonnie's delicious evening meals that are available for a modest per head charge. If you’re a vegetarian or a vegan there is always an alternative, so you’re covered too. There’s free Wi-Fi for those last minute emails or those of you who just can’t live without your digital tether in paradise. Ignacio Springs Bed & Breakfast.